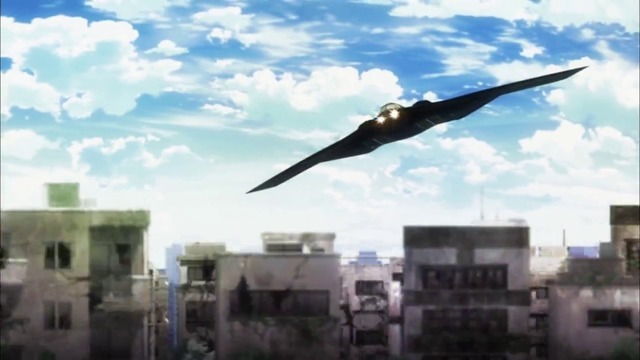 Coppelion — First they mistake a stealth bomber for a crow. It attacks them with a machine gun mounted to its nose. Then they catch up to the stealth bomber in a Jeep. Then they shoot it down with a rocket launcher. Because the bottom is its weak point. Then they are worried that it will crash land in a tiny pond, which will douse the fire, allowing it to immediately take off and escape again. When it has a giant hole in it and has just crashed. Oh, and by the way, these girls who mistook a stealth bomber for a crow are professional soldiers. I… I like Valvrave, and this is too stupid for me. Dropped. Tokyo Ravens — They seemed to have toned down the stupidity from the first episode. I’m still watching it, but it hasn’t kept my interest much. Especially with the tearjerker about the girl’s brother. I feel like I’ve seen that story before, many, many times. Gingitsune — The new guy annoys me. 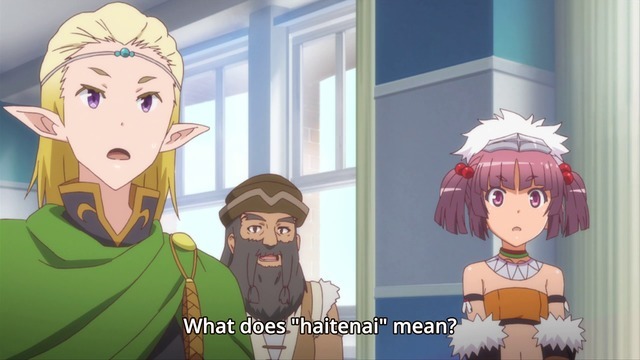 Outbreak Company — The comedy here is pretty good. What he’s teaching them at school is hilarious. The new furry character seems useless at the moment but I’ll withhold judgement for the time being. Golden Time — Let me be the first to say that I am shocked— shocked— that the loli is getting a boyfriend. That never happens in anime. Much less by the third episode. I guess we’re getting a love triangle with Linda now? Linda is a much better choice than the lead female. But anyone is a much better choice than the lead female. White Album 2 — Is anyone not shipping Touma? This love triangle is way too one sided. Just like True Tears where Noe is the one and only possible choice. The other girl (forget her name) might as well have never existed. Log Horizon — I don’t know what it is about this show. Yes, I realize there isn’t much of a conflict. But I’m enjoying it nonetheless. First of all I think it does a much better job at capturing the feel of an MMO than other shows— even though they’re trapped in the game world, no one has any delusions that playing the game is the be all / end all of existence. In fact, now that they’re stuck there, most of the people don’t seem to give a crap about the game. The other thing is that the characters are adults, and it shows. They are much more mature than your typical anime characters. At this point of my life I can relate to them much better than the umpteenth show about teenagers. I’m fine with LH as it is thus far, as it hits my geeky soft spots for recognizing such little details. I see potential slow buildup in the horizon, but I am enjoying the slow pace and reveal of powers and people. I am assuming there’s many more characters yet to be revealed completely. I stopped the video to count how many were in the “Tea Party”, and noticed the cat-knight was there as well as our Guardian and Enchanter main characters. There’s enough room to do more without revealing impending doom from the get-go and never really reaching there because there’s always hurdles in the way. Let the challenges surprise me as they come. Log isn’t about high drama / crime mystery, but more how to say, social & world exploration based? Some people need the ‘big bad boss’ on the horizon on their minds. For me, that’s already been done. I’ve seen all those bosses, slain them or watched shows about the pitfalls of the imperfect pursuit of slaying them. I’m perfectly OK with just existing and taking the world step by step with light-hearted and self-aware / deprecating characters. The reaction of our main characters finding out our girl was college age was golden. Like you said, very refreshing we have actual adults. I hope I’m using the following words right: the show is more seinen than shounen, more mature than assuming the viewer knows nothing. I’m liking it for those reasons. Maybe it just hits my geek buttons and comfortable MMO nostalgia chair while glossing over the distasteful bits, but that is enough for me. Galilei Donna — Needs less feelings, more pirates. We, the proud Hiromifags, still enjoy the tears. Thank you very much. Allow me to join you in the tear licking. True Tears… The shipping war that never dies… In several decades from now it will be called the 100-years shipping war… except it will actually be 116. Some people have awful taste. Can’t be helped. Actually… I was referring to both sides of the equation. Sweet I got quoted! Btw I absolutely adored your SAO fan fiction. That show is not to your taste, and that seems consistent with your tastes in anime, but bravo for following through with the satire all the way. I liked SAO but I recognize its flaws and girl of the moment side stories being presented in lieu of main story was the biggest. LH’s direction seems like slow build-up, but it is linear. What happens next for our adventurers? I suspect eventual character spotlights and team ups with different aspects the former tea party, each with individual personalities and sitcom conflicts for the group to resolve. Nyanta may leave and pop back in later, I would think. Outbreak company: furry girl definitely is a joke stepping stone so far, but also another step toward light politics and expression of our main characters desires through artist expression (girls drawing abilities). I see her more as a story device than character on her own, but like you we’ll see. Either way, all of it is jolly good fun, and I’m ok with that. Tokyo ravens: The pacing seems off to me. I like the show, maybe it is my own individual viewing, but some sparks to draw interest aren’t catching fire as they should and I feel like the presentation is off somehow. I think the show should pendulum between drama and comedy but we aren’t seeing much of either ends, but only the bland center. I need to rewatch to evaluate again. I couldn’t help myself after the first episode, saw the manga and was hooked there, but the pacing and presentation of reading is a much different experience live. I had a lot of fun writing my SAO fanfiction. Can’t wait for the second season! Your direction for Log Horizon sounds about right to me. Eventually we’ll figure out why our main character refuses to join guilds, resolve his issues and get a recreation of the tea party to beat the final boss and return to the real world. Furry girl does seem more like a story device than a character. Especially in the most recent episode, how she is the cause of most of what happens but never actually speaks much at all. Coppelion is killing me inside every time I watch it. I was disappointed by K, but Coppelion takes it to a whole new level. It’s a neat concept, but the forced drama and ridiculous action scenes ruin it for me. I’m holding onto a shred of hope that it might improve once it gets out of this purely episodic crap, but I think you might be on the right track by dropping it now. Yeah. K disappointed me as well, but at least there were some things to like about it. Like… how high the people who made it were? And that it looked cool? And all the gay shipping was mildly amusing? Coppelion doesn’t have anything going for it.